Now that 2018 is over and done with, it’s time to take a look back and admire the lowest-selling cars in the United States. Did your favorite, low-volume supercar make this list? The answer is probably, yes. Pickup trucks and SUVs nabbed the top spot of best-selling cars, which was to be expected. But we’re not concerned with those. It was easy to buy a truck in America in 2018. Easy, I tell you. I’m more interested in the unpopular cars, pulled from the ever-excellent GoodCarBadCar. A note: GCBC lists cars like the Toyota Venza, which obviously wasn’t a 2018 model year vehicle—it’s a holdover from previous years that sold last year. This list will only include 2018 and 2019 model-year cars, and I also only mentioned cars that were available for the entire calendar year. My sense is that the Audi TT doesn’t receive as much love as it deserves, but I also get why. It’s a small, two-seater coupe that probably isn’t very practical. And it’s expensive: Audi’s website lists one starting at $44,900. But its compact stance and short wheelbase should make it a fun, spirited car. Audi sold 1,289 TTs last year. Were you one of the people who bought one? In 2017, Smart discontinued U.S. sales of its gas-driven models and pivoted to electric cars for 2018. I don’t know if it was the electrification or just the fact that it’s a ForTwo, but sales came to 1,276 models. The Smart is a very good city car, but I’m not sure an electric Smart as a city car is the best idea. You need a place not only to store the car but to charge it as well. Can you imagine running an extension cord from your wall outlet, out the window, down the building and across the sidewalk in order to charge your street-parked car? I’m sure it works for someone somewhere. But clearly not that many people, judging from the sales numbers. I mean, it’s the R8. Duh. It’s an expensive supercar, so it’s not supposed to bring in huge numbers. But the fact that Audi still managed to sell 927 is actually pretty impressive. I’m really, really thrilled with the fact that it still comes with a naturally aspirated V10 engine. I don’t know how many years he R8 has left, though. The BMW i8 is an awesome hybrid sports car, notable for its tech and the fact that it looks like a concept car you can buy. But it’s been around a hot minute, and like all sports cars, sales aren’t great. For 2018, the i8 got a slight power bump and the Roadster was introduced. Still, BMW sold 772 i8s, which is actually a big jump from 2017's 488 examples moved. Maybe there’s something in offering a convertible after all. Anyway, I don’t expect the i8 to move in huge numbers ever, as it’s on the expensive side. Also, one of the chief complaints people have about it is that the performance figures just aren’t “good enough,” though I heartily disagree. I like this car very much and everyone should at least drive one before they dismiss it. Ultimately, the Nissan Juke made it onto this list because its death was only reported halfway through 2018. This year, though, you will not be able to get a 2018 model Juke in the U.S. Nissan sold 731 of them and you can see the sales numbers drop off towards the end there. What replaced the funky Juke? The Nissan Kicks. Joy. Again, no surprises here, especially when you consider just how expensive the GT-R has gotten in its old age. But it’s still fast as hell and delightfully vintage inside. Not because that was on purpose or anything, but because the car is just so old. Nissan sold 538 GT-Rs last year. Please buy more of them so it sticks around. It would be a blow indeed if we lost the GT-R without first naming its successor. I said it in 2017 and I’ll say it again for 2018: I totally forgot the Kia K900 was a thing. Kia sold 354 of them, which is less than the 455 Kia sold in 2017. It just feels like an agonizing march towards death at this point. At least 2018 saw a refreshed face. Saaaaad! Only 238 4Cs were sold last year, and it probably won’t help this year that the hardtop version was killed off in U.S. and Canadian markets. But the silver lining here is that you can still get the convertible version. I don’t know though. I think sometime soon, we’re going to see the 4C killed off altogether. I just hope FCA has a good replacement planned. These cars are a hoot and hats off to the people who bought them. Now, this one I don’t really understand. The new NSX is about as powerful as the R8 and costs about the same, yet the R8 outsold it by a lot (there were 170 NSXs sold last year). Is it because it’s a hybrid? Because it’s an Acura? Most mysterious. In fact, I don’t actually hear or see much of the NSX these days. I run into way more R8s on the street than I do NSXs. It’s kind of a shame because the NSX is a great car and it’s extremely comfortable to drive. Looks great, too. We’re fans. 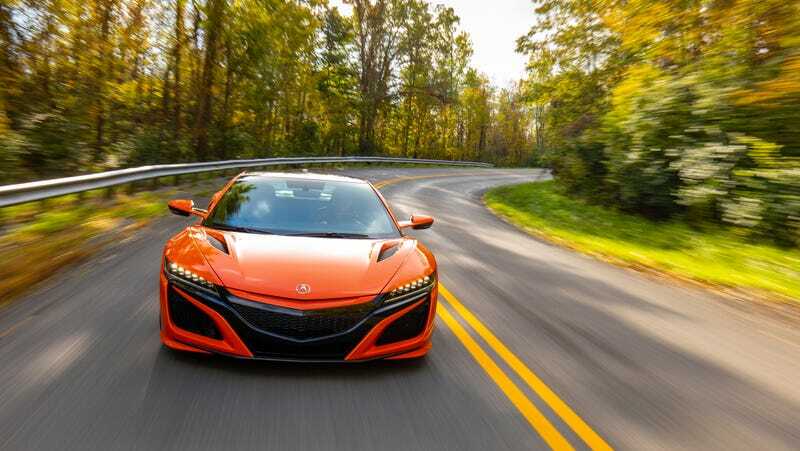 Maybe it’ll be like the old NSX, where people really widely see its appeal after it’s dead. And finishing off our list is the Ford GT. It was all car internet could talk about for a few months there. At first, Ford said it would only build 500 GTs. Then it said it would build another 500. And last October, it said that it would built yet another 350. Amazing what kind of motivation comes from high demand and a near-half million dollar price tag. At the same time, infamously, Ford didn’t make it easy to own these things, and it’s become somewhat more known for ownership drama than its actual performance. Looks like Ford spent 2018 diligently fulfilling those customer orders. A lucky 126 people received GTs last year. Clarification 1:53 p.m. EST: This list was compiled from sales data that each manufacturer publishes at the end of the year. The reason why boutique automakers like Koenigsegg, Pagani, Ferrari, Aston Martin, Lamborghini and McLaren weren’t listed is because they do not provide the data. Or, if they do, they’ll say something like “announces record global sales,” as McLaren did. But McLaren’s announcement didn’t include specific sales figures for its models.